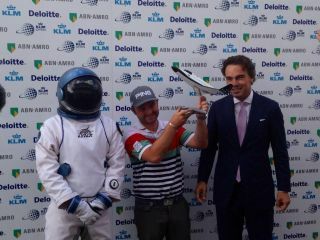 Golfer Andy Sullivan holds a scale model of XCOR Aerospace's Lynx rocket plane after winning a trip to space when he sunk a hole in one at the KLM Open tournament in the Netherlands on Sept. 14, 2014. One swing just launched a golfer into suborbital space. Andy Sullivan won a free ride aboard XCOR Aerospace's Lynx rocket plane after acing the par-3 15th hole Sunday (Sept. 14) during the final round of the KLM Open in the Netherlands. The one-passenger Lynx is designed to fly people and scientific experiments to an altitude of about 62 miles (100 kilometers), the generally accepted boundary where outer space begins. "I'll have to pluck up some serious courage, but I'd love to do it," Sullivan, 28, told the BBC, describing himself as "not the best flyer." "I didn't play great through the round, but then I hit a perfect shot like that," the British golfer added. "What an experience. My caddie just shouted, 'We're going to space.'" Tickets for the Lynx currently sell for $95,000. A seat aboard the space plane's competitor, Virgin Galactic's six-passenger SpaceShipTwo, will set you back $250,000. Both vehicles may begin commercial operations within the next year, company representatives have said. Sullivan ended up shooting a 67 on Sunday, finishing the tournament in third place, the BBC reported.